I’m hoping, really hoping, that the next book in George R R Martin’s A Song of Ice and Fire series comes out this summer. But until then, I’ll be re-reading some excellent fantasy. Starting with the adventures of this little guy. 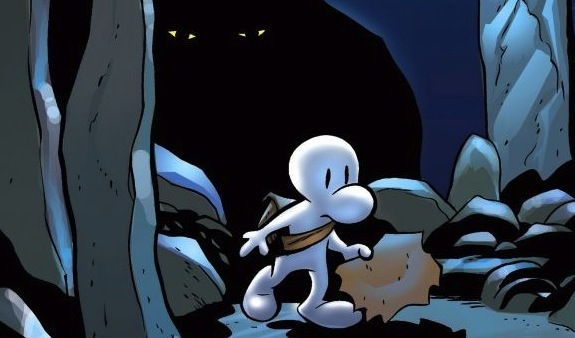 Should you not recognize him, that’s Fone Bone, the diminuative protagonist from Jeff Smith’s epic fantasy graphic novel series Bone. I first started reading Bone by picking up issue #13 in around, oh, 2005. I had no idea what was going on in the comic, I’d never heard of it, but I was going through a phase of collecting black-and-white comics and supporting non-DC/non-Marvel properties. 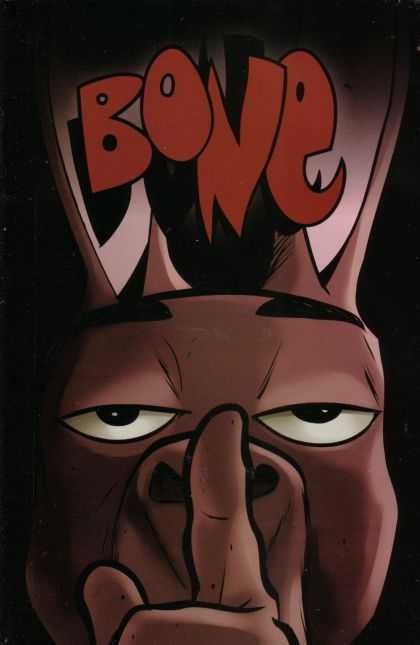 Issue #13 of Bone centered on this little character named Fone Bone (who reminds me of Pogo Possum) with a handful of talking animals and a cute girl named Thorn. In the issue, in quick succession, strange hairy creatures were introduced along with a huge monstrous version. And a sinister hooded dream-invading creature. I found it an interesting and charming read, so I started picking up the trade paperbacks. Which were awesome. The artwork was clean, simple, and outstandingly great. The story was weirdly fun, light, and deadly serious all at the same time. I’m going to do a quick non-spoilery overview at a very high level. The story of Bone is a classical fantasy, it’s a kind of low-tech medieval-sorta setting, with magical creatures, a secret warrior society, a history of the Last Big War, and an awakening evil. Our primary point of view is Fone Bone, who is charmingly endearing. I think it was brilliant of Smith to develop a nearly-featureless protagonist. Fone Bone becomes a blank slate where we can attach ourselves into the story. There are wonderful characters and a surprisingly emotive storyline. If you’re not allergic to spoilers or if you’ve read Bone and are curious about two moments that really struck me, feel free to check out my Bone spoilery-post on my secret backup spoiler blog. Anyway, I’m still waiting on A Dance with Dragons from GRRM (again, I’m hoping this summer. Please!) but until then, I can re-enjoy this wonderful story. I can’t confirm or deny the presence of dragons in Bone. Should you check it out (at least the first trade paperback) please let me know what you think. Images from Jeff Smith’s BONE, obviously. I see this is an old post but I’m always looking for new and good fantasy to read. This is a definite try. Thanks! Well, the post is new, but the subject is a decade old or so. If you check it out, I hope you like it! Thank you for stopping by, it’s much appreciated. I’m hopelessly biased. Bone hits me in all of my I-Love-This buttons. OMG. Yes. I’m already in 2015. I had no idea you were a time traveler!!! Greetings, Chrononaut! Time travel is one of my many talents. Thanks for the recommendation. I need a good fantasy read before I get sucked into the seven kingdoms again! You can post astrological signs for the primary characters too! And Terry Pratchett is great as well, although I’ve only ever read Reaper Man, I should totally read all of his other Discworld stuff. It’s an obvious gap in my education. So we’ve recently been reading Amulet by Kazu Kibuishi, and Jeff Smith was his mentor in creating comics. So if you liked Bone, you’ll probably like Amulet. Just be careful – Amulet is not a complete series either, so you’ll be stuck before long waiting for the new volume there, too! I should at least check Amulet out. I saw your mentions of the book in your EXCELLENT blog. You are always welcome to promote, shamelessly! It also likely doesn’t count when the post in question is months old… but hopefully people are reading this! Bone sounds great – definitely want to give it a read. I have loved Bone but never finished the whole story. 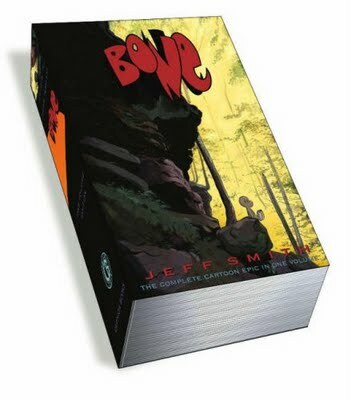 I have the first printing if the Out of Boneville hard cover signed by Jeff Smith. I believe I met him in Pittsburgh. Happy birthday, PS!